Sigh. Again. Second place by one point, and we had many second-guessed points that we gave up throughout the course of the evening. But with our regular compliment of team members and a whole round on Cyberpunk movies that we did quite well on, it was an overall fine showing. And once again, I'm forced to emphasize that the point of Geeks Who Drink is going out with my family and friends and enjoying each others company. And winning, dammit. We're going to redouble our efforts next week, I'm sure. I know everyone out there is writing their obligatory Thanksgiving post, and Stella is no exception. As a telecommuter what am I thankful for? A wonderful manager who enthusiastically supports my remote working, is always concerned with how I'm doing and connecting with colleagues, and who is one of the most kind, scrupulous, and ethical people I know. A smart, hard-working, savvy, fun employer that gives me the opportunity to do interesting work for a really good cause. The ability to live in a place of my choosing without needing to worry about my work situation -- when work is independent of location you enjoy a feeling of freedom and flexibility that is unparalleled. My left pinky, and truly the full use of both my hands -- doing what you want, when you want to with your body is a joy that should be treasured every day. And of course, Stella is grateful for her wonderful family, outrageous good fortune and health, the opportunity and hope that exists in the world even in times of trouble. But that has nothing to do with telecommuting, so I relegated it to the end of the post. What Won't You See Coming? Over the weekend, Mr. Commute and I unpacked some boxes in the garage and discovered a large cache of videotapes we made of one of our favorite TV shows that aired in the early and mid-1990s. We finally acquired a VHS-to-DVD burner, and so we're transferring these gems to a more modern medium. The shows are great, but the best part about the whole process is the commercials. Remember 10-10-321? A ton of big stars advertised this service in the waning days of payphones before cellphones became ubiquitous. There are also a ton of ads for cameras and film. The idea seemed to have been that you would want to take the highest quality picture possible so that when you scanned the photos in (or had them scanned at the processor) they would look good on your computer. It was kind of weird. Car advertisements were remarkably un-different than they are today. Zooming around, maybe with slower editing. And Geico was running a weird ad starring the AFLAC duck (or maybe it's just that all ducks in television advertising look like the AFLAC duck because AFLAC so owns the duck thing...now that's branding kids!). In any event, there is nothing in any of the ads from 1995 that suggests smart phones, iPhones, internet fast enough to watch more than a clip on it (although SciFi and Comedy Central were both pushing video on their sites even back in the dark ages). Ipods and digital music aren't even a gleam in the eye of advertisers. And then this post on growingchanginglearningcreating (not sure if that's all one word or what) got me thinking about things that I don't see coming now. Should Shut-Ins Get Flu Shots? Last year at this time, Stella was working in a Real Office that was in a medical setting, and you better believe she hustled herself over to the nursing students to get a flu shot. Everytime I go to a medical facility (doctors offices, hospitals, the pharmacy) I feel like it's vaguely filthy and I wash my hands a little bit more obsessively than usual. But now that I'm back to being a full time shut in, I shouldn't need a flu shot, right? Not so fast. This article from Web Worker Daily posits that working from a remote location may make you less prone to catching things, but I'm not so sure. While it's true that you're not exposed to all your colleagues coughing up a lung on your keyboard because they don't want to use up a precious sick day, you still have to encounter your friends and neighbors. And sadly, some of them may be sick when you see them. Your children bring home crud from school or daycare, or your spouse who works at a used bookstore gets sneezed on by one of his erstwhile colleagues or customers, or the UPS man vomits on the package before he hands it to you, and before you know it, you've been exposed to viral mayhem. And then you're sick. So working at home can't prevent every illness, unfortunately. I will say this: telecommuting may make you less likely to take a sick day when you're feeling iffy because the barrier for going to work is set so low. Even if you really feel crappy, you will probably end up shuffling down the hall to read some email just to take a break from watching various Judges adjudicate mind-numbingly dumb cases on daytime television. But prevention is the best medicine, so get a flu shot, people. For the love of pete, you don't want to get sick. This article from PCWorld notes that the bad economy may be good for the spreading of telecommuting. As you might imagine, Stella agrees wholeheartedly. In times when giving people raises may be downright impossible, giving them telecommuting instead is a great way to reward high performers with a benefit that improves their lives in both tangible and intangible ways. The tangible: reduced commuting costs, more productivity, saving the company money on lighting and heating (Potentially: If you send everyone home for a work at home day on the same day, you can turn off the heat and the lights; if you stagger the days you may not notice the same impact as you do with one big day. And you should make your mass-work-at-home-day Wednesday, to counteract the potential three-day-weekend-effect that you might notice you did such a thing on a Monday or Friday.). The intangible: feeling like your employer really trusts you and values you, getting to be a part of this cool remote working movement, less of your time lost to commuting. These are good things. I also think that business gets a big advantage in tough times by having the tools of telecommuting already tried and tested by their telecommuters. Suddenly nobody wants to spend the money to put people on planes to do a two hour demo of the software. Tapping into the network of experienced online meeting-holders to teach their Real Office colleagues how to use those tools is a great way to save that travel money. Soon, nobody will have to go anywhere, and we'll all just meet from the comfort of our desks, whether that desk is in a Real Office or in the spare room. ...you have a dream in which you take an extended nap. Seriously, Stella is dreaming about sleeping whilst sleeping. That seems kind of sad, really. How Did I Miss the Telecommuter Re-Moniker Contest? I know what you're thinking: it's too much time with the gin and phonies, Stella. You gotta be sharp to stay on top of things around here. Nevertheless. I'm not sure, really. Cloudworker? 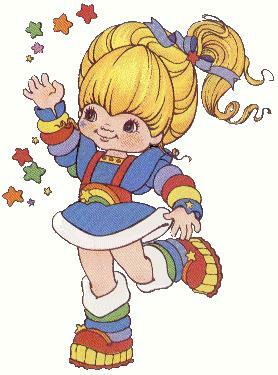 It's a little Rainbow Brite for Stella. Although it could be worse, apparently. Somehow "mobiworker" got 10% of the votes. Until we're all making semi-ambient electronic music and making a stink about our books on MTV Cribs, I refuse to go by "mobiworker." Well, two of our team members were knocked out of commission last night. Apparently the pregnant one was "sick" and her baby-daddy (e.g. her devoted husband) had to take her home. I'm thinking Dead Kennedys on Rock Band was beckoning in a more appealing way than taking a test in a bar, but I'll accept her explanation. So a second place finish was all we could do. And they called us "Gin & Phonies" all night, totally missing the pun of Gin & Phonics. Ha ha. We all agree that Margret is the decisive brains of the operation. We did well enough, but I have a feeling that Margret would have overridden my brother in law's guess on our sudden death round question and would have instead gone with my answer. My correct answer. That I wrote down, and scribbled out in deference to my BIL's wrong answer. The federal government is really taking the lead on big, institutionalized telecommuting. And it's doing this under the current administration -- I can only imagine what a broadband-using paradise it will be when things change over in January. So officially committed to telecommuting is the federal government, I make a point of going back to their fine website frequently, and I always find something good. Like this listing of key practices for a successful telecommuting program. It's right on the money. And for far-flung telecommuters like Stella, this means one thing: sitting in my home office continuing to work whilst my colleagues toddle down the hall to enjoy assorted pot lucks, cookie trays, shrimp cocktail, and occasionally free drinks. Actually, avoiding all that stuff doesn't sound that bad, now that I write it. I only need to resist the treats that normally reside in my house, without contending with a parade of fattening temptations that appear in the break room at this time of year. That said, it is also a well-documented fact that holiday party attendance can be an important career move in both a positive and negative way. The positives: networking, a chance to meet people you might not normally encounter, free food and drink. The negatives: lampshade on the head. But what kind of holiday party equivalent exists for the telecommuter? I suppose someone could drag a laptop and camera to the party venue and I could watch from home. But that's kind of lame. I will often start a personal party at the same time -- I'll go to a movie or get a pedicure or something fun. This year, I'm thinking about trying to organize a telecommuter office party here in my town. I first need to figure out how to hook up with other telecommuters (without getting involved with a lot of work-at-home multilevel marketers -- nobody wants to deal with those people because they're always trying to rope you into selling their fine products). From there, it should be easy. Bar, hors d'oeuvres, terrible holiday sweaters, fun! So if you're a telecommuter in Albuquerque, let me know. Q: What Is Easier With Two Hands? - Fixing one's hair in a style other than "stiff crazy mop"
I'm still very new at my job, closing in on six months, and so I'm still meeting a lot of people for the first time. And because I'm meeting a lot of people for the first time from 2000 miles away, it's extra important that I be able to clearly articulate what the heck it is that I do. I launched an intranet for the fund raising division of the university I work for. I feed it with tidbits as well as figuring out what features and what not we need to add to it. I can do some of the technical stuff, but the guys who manage the server haven't really freed up my permissions. Plus I didn't work with Sharepoint even a little bit until I started this project, so I'm pretty much flying by the seat of my pants. Thank goodness I'm not troubled by not actually knowing how things work and willing to monkey around with it to make it do what I need. I'm trying to get online giving squared away. This seems to involve everything from creating templates and training the finance people so they can adequately reconcile the various accounts, to working out the logistics of account set up, to building forms, to counseling various fund raising offices on how best to use online forms in their sites. I execute mass email campaigns -- but actually we're still trying to figure out what technology will be best. So in fact, I cajole the central IT guys to install upgrades on their list server, I paw through the various systems that we're already subscribed to to figure out what they're capable of, I advise the direct mail people on how best to segment and proof their copy, and hope that we can actually drop the stuff on their target date. I'm an internal account manager for all of our electronic communications projects. That's it. It's actually pretty simple: I am here to ensure that customers (my advancement colleagues) get the results they need on their web projects. If they don't know what results they need, I help them figure that part out, and then I recommend ways to get to that end. If I hear about something that is going on that should have a web component, I insert myself into that process on behalf of my customers. Okay, so whether that role actually makes structural sense, given that I operate out of the Advancement Services part of the organization I don't know. But much like all my web projects, I don't care where it is on the org chart -- does it make sense from the customer's point of view? Okay, we're probably not technically alcoholics (one of us is pregnant, for pity's sake) (oh, and it ain't me, babe) but we did come out winners on Wednesday at Geeks Who Drink. The pluses: going out with beloved friends and family, enjoying a tasty beverage, pretending I have a social life, pwning the competition. The minuses: it's in a cavernous sports bar that caused the more noise sensitive of our group to hold his head in agony, the waitstaff is all female and all clad in tiny referee shirts and very short shorts. Which in and of itself isn't terrible I suppose, but it just felt like I'd stumbled into the wrong place. Will we go back? 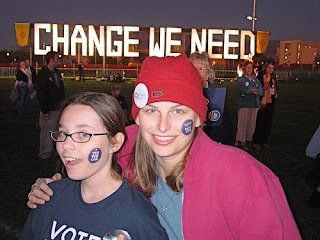 Yes, we must because we won a gift certificate with which to acquire complimentary sliders and beers when we go back. * This is the name of an actual alcoholics' support group that meets in Baltimore. We never were really sure if it was intended to help people not drink, or to celebrate the awesomeness of an alcoholic lifestyle -- you can't keep us down, Bill W! But I will admit that the time my mornings begin (circa 5:20 am) can become a bit of a drag. Particularly if I'm not well-rested because I'm soldiering through my last two days of wearing a stinking (actually smelly! how fun!) cast on my left hand. It's like sleeping in one clog. That's why I read this item from Jezebel with interest. Morning routines are fun for the shut-ins because we don't have the same requirements to be out of the house in time to catch our bus, train, or traffic jam. That said, it can be a strain. 5:45 Clothes, slippers, and...what's that I hear? The robotic coffee maker is firing up! 5:50 I walk out to my office and fire up the computer because it takes it 10 minutes to start itself anymore. I don't know why -- I think it has something to do with my network because it didn't do it when I was on site. Stella is afraid of many things that she doesn't understand well. In fact, I am often mocked by Mr. Commute for my conviction that the furnace is only moments away from leveling the house, that the children are somehow in danger of the electricity jumping out of the sockets and onto forks they are holding several feet away, and the like. Imagine my horror upon reading this article. Radon? Really? I hadn't even considered the possibility. All irrational fears aside, the author does make some good points about creating a healthy environment for yourself. This means a proper chair, good lighting, and a fire extinguisher. Actually, you should have one of those whether you work from home or not. What if the lampshades all spontaneously combust? Think about it. Do You Employ Folks Who Live in Kitsap County, WA? View Larger MapAre you interested in trying out a telecommuting program, but you'd want to have some support? Well, perhaps this pilot program will be of interest to you. As part of their regional planning process (and because it seems like there is a boatload of bottleneck-inducing highway infrastructure projects going on at once) the Washington DOT is running a program to encourage and measure the impact of telecommuting on the Kitsap peninsula. You get support, a telework tool kit, and you'll be a part of an official program that will yield (potentially) good data on the impact that formal telework support programs have on the environment, traffic, and so on. I know. You actually are busy. But sometimes it's very quiet around the house. So maybe you're in a business where the appearance of busy-ness is key, or maybe you're a freelancer who's trying to compete with much bigger "real" companies. In that case, maybe this Thriving Office CD (reviewed here) is just what you need. I don't know whether it's really necessary, honestly. If there could be some sort of frequency cancellation technology that would specifically negate the sounds of dogs barking at the mail carrier, that would really be something. It seems that no matter when I schedule meetings, the moment I get on with people is the precise moment that the front door is menaced by the USPS. But it turns out that the jellies that are spreading around the world are instances of Jelly, the totally fun co-working sites that people participate in. Casual co-working sites are a good way to break up your routine a little, meet like-minded people who work in the same ways that you do, and maybe network a little. Personally, I've been considering trekking over to my local coffee shop one afternoon a week just to have some fun and jolt my brain a little bit. It seems like it would be easy enough to do -- my Skype rings wherever my computer is (or I can just forward it to my Blackberry), the wi-fi is everywhere, and I'd be drinking coffee anyway, so why not give it a try? I'm just a little paranoid because of my long held position that as an employee, I should be grinding away in my office just like everyone else. I'm a little conflicted about it. What do you think I should do? Because I am an employee who telecommutes, I most often worry only about how you, my fellow mortal, can get out of the office and into some slippers. But maybe, just maybe, some of my gentle readers are managers who want to offer this awesome benefit to your employees. To you I say: Kudos! And check out this checklist from the government telework people. The steps they outline here really are the basis of good telecommuting management, and aspiring to these guidelines might help you avoid some problems as you roll out your telecommuting plans to your employees. I really like this: "Base denials on business reasons." Just like I continually harp on employees to steer clear of heartfelt explanations of how they have no daycare for little Susie, or Grandpa Ulee is too addled to be left home alone, managers, too, should avoid any whiff of the personal when denying (or approving) telecommuting arrangements. This isn't to say that when an employee's personal problems are interfering with their productivity that you shouldn't deal with that (whether the person works in the Real Office or in slippers). It just means that you should focus on the "you're not getting work done" part, rather than the "it pisses me off that I know you're throwing laundry in during the work day and I just feel like that's wrong even though you're getting more done than ever for us here in the office". You ultimately have to trust your employees and be comfortable measuring results rather than time elapsed. What Is It Like to Work At Home? I'm a technology person in a sea of people doing other kinds of work, and in general my colleagues have no idea what the heck I do all day. So I've blogged about that. This article is from another point of view: a human resources guy who works for a geeked out employer (HP, one of the great telecommuting-allowing employers out there). This article has a very accurate description of what it's like to work at home. Especially true: the fabulous luxury of popping into the house to help with a five minute family thing (wrangling a small child into a sweater, moving laundry from place to place) and then being back at work in the blink of an eye. It takes about as much time as listening to that person who has to wander into your cube to regale you with details about their recent digestive disturbances, but it's much more pleasant. You know telecommuting has arrived when serious newspapers are covering what to wear when working at home. Like in this piece from the Washington Post. The cheapskate in me must object to the notion of buying an $88 cardigan to blog in, but I think that $9 is a lot to pay for a coat at the Thrift Town so take my comments with a grain of store-brand salt. Despite my caveats, I strongly urge you to read my previous fashion advice. Then do the opposite. This quick little piece from CIO has seven quick reasons why telecommuting is good for business. The information is good fodder for your telecommuting proposal, because most of the pros are from the employer's perspective. One that I think will particularly get their attention: "Telecommuting means no excuses for missing deadlines." I like this because it's absolutely true. I am one of a small collection of full time remote workers in my organization right now, and I keep (informally) lobbying my Real Office colleagues to exercise their ability to work from home for their own purposes. It's a hard-charging environment and there are no excuses for not working until the job is done. But the fact is that people who know how to use tools can work wherever they are, including home. So they should do so.